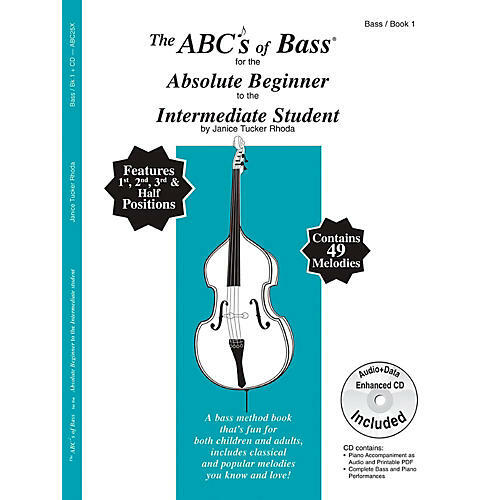 This best-selling instruction book along with CD is the perfect start for an Absolute Beginner to Intermediate Student of any age on the Bass. The many melodies plus short warm-up exercises and study pieces advance students technically in an easy and enjoyable way. Simple duets, scales, a note-reading worksheet, glossary and practice chart are also included along with many graphs to show left-hand finger placement. The included CD consists of three components: 49 performance pieces of bass with piano accompaniments, piano accompaniment tracks by themselves for play-along, and a printable pdf file of the piano accompaniments. This book covers first, second, third, and half positions.